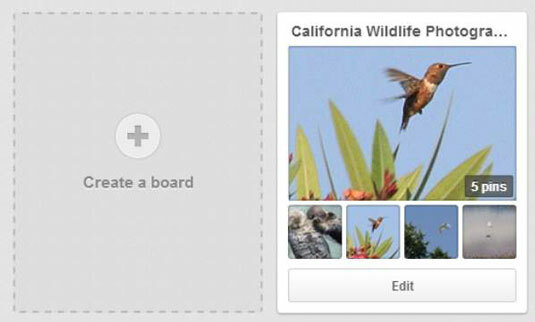 Every Pinterest board has a cover image, the featured image that introduces your board to other users. 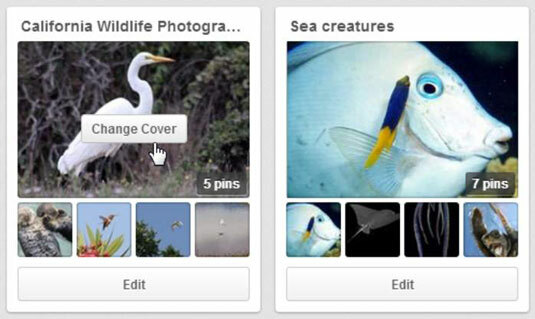 You can change the cover image and order of Pinterest boards after you create them. This makes it easy to organize and change the overall design of your profile page. This is located at the top right of the browser window. Your main profile page opens with all your boards. 4Roll your cursor over the board you want to edit. You will see options appear on the one you choose. 5Click the Change Cover button that appears. The Change Board Cover dialog box opens. 6Click the right or left arrows in the Change Board Cover window. 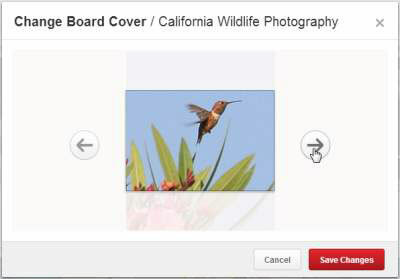 Keep clicking until you find the pin (the image or video) that you want to use as the cover of your board. 7Click the red Save Changes button to select the new cover. The Board Cover dialog box closes, and the new cover is displayed on the board in your main profile. Your cover image should not only properly represent the rest of the pins in that board but also work well with the rest of the cover images on your Pinterest page. Feeling creative? You can create cover images that will grab users’ attention while still explaining the content of your board. Remember that you have the ability to upload images from your computer, not just pin existing images from around the web. Have fun with your cover images!